If you were to browse the Millfield School website, you would see an absolutely stunning campus. That word “campus” has been deliberately chosen to liken the school to a university, to give a feel for the size of the school, its diversity and its incredible facilities. 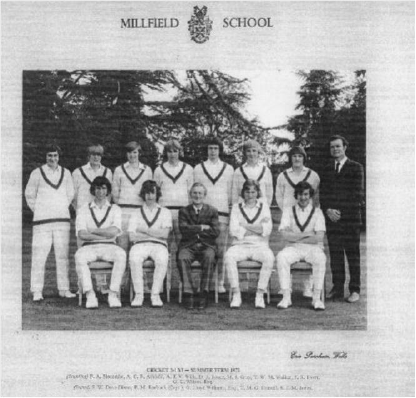 For Old Millfieldians of some vintage, it is barely recognisable. So I would like to transport you to the late 1960s and early ‘70s, when there were still relatively few brick–built teaching spaces. Many lessons were in wooden Pratten Huts, some only a little bigger than garden sheds, or in old corrugated iron Nissen Huts, dating from the days the site was occupied by the armed forces. A biology lesson in a cold Nissen Hut when you were wet through having had to hike from some other lesson miles away, was always rather interesting – I think that is the euphemism. We used to wear welly boots in the winter, because of the mud and puddles. Paths were also in short supply. 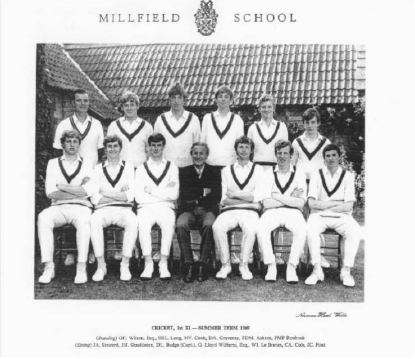 OMs may also remember the cricket pavilion and the swimming pool. The swimming pool was built for water polo, meaning it was 25 yards in length, only 4 narrow lanes, shallow enough to stand in and a single depth all the way. In the time I was training there, being mini-bused over from Edgarley, the pool was open-air for a while and then a Perspex half-cylinder roof was constructed over the pool. There was still no seating alongside nor any changing rooms. We all had to change in the cricket pavilion, go out through a side door and then run through any howling gales across to the pool. Many a national or international record holder, indeed several Olympians, came through that regime. Nothing was gifted to you. Nothing was fancy. You worked for what you got. You worked with the people around you; people full of character; people wanting to “give it a go”. Whatever you were good at, almost inevitably there was someone better. If you were good at 2 things, then you would not have to look too far to find someone who was good at 4 things. I hope this has given you some understanding of the school environment – the one that Peter was immersed in from the age of 12. Our ages are such that Margaret (aka Roebuck i) was in Upper Sixth when I arrived at the Senior School, and Peter (aka Roebuck ii) was in the year below her. I came into form REA1 as Roebuck iii, no less. Both Peter and I lost a digit when Margaret left. When Peter was in his last year, he was a house prefect – in the Day Boys’ House, of course, with our parents both teachers at the school. Needless to say I was a meaningless shrimp to all these older pupils, though by now I was in a form called RA1. With a degree of symmetry, in the following year, my “O” level year, I was in form 4A1. All the Day Boys and Day Girls had a weekly assembly together – it was on a Wednesday morning and was held in the music hall. At the time, the music school was in the little Lodge at the entrance to the Main Drive and the hall was regarded by some folk as a carbuncle on the side of the Lodge. Whatever view you took, it was big enough to seat all the Day pupils. By custom, alongside assorted announcements and congratulations, one of the house prefects would stand up and give a presentation. Now it was Peter’s turn; he had given me no warning whatsoever – not a whisper. Had he forgotten? What on earth would he be saying? My pulse raced; my face flushed; my seat just would not swallow me up. By my recollection he said eight words: “Be quiet and listen carefully to these words”. Then he put the stylus down for a track on an LP he had brought in from home: James Taylor singing “You’ve Got a Friend”. There wasn’t a murmur in the hall; we all listened. When it had finished, Peter lifted the stylus, turned off the record player, packed away his record and left. We followed. Barely a sound was made as we left.